Thank you for subscribing to be the first to hear about all the news surrounding my novels. As promised in my last post, you’ll be the first to know about the special pricing for my newly published box set for the Oceania series. As a Merry Christmas gift to you, today and today only, you can buy the box set for $0.99. Click the image below (or this link) to purchase it! So I’ve been keeping a secret project from you all for the last few months. I’ve decided to release a box set of the current books in the series! If you’ve already bought each book in the series, thank you! However, this box set does include additional extras that I will never be releasing to my blog or anywhere else. It includes a detailed map of the Spirit of the Sea from Shark Station, a short story about Allie’s life in Chicago in 2276, unshared deleted scenes from Allie’s Return, and an alternate ending to Shark Station. It is in Kindle Unlimited and I plan to keep it there. Also since you have subscribed to my news feed, I’ll be sharing a discounted price day with you, so stay tuned for that. If you want to take a look at the box set now, click here. 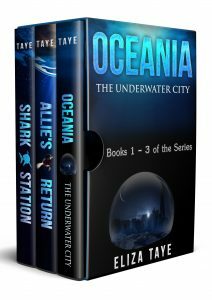 Now Released – Book 3 of Oceania: The Underwater City Series! Allie and Dylan face their greatest challenge yet in the third book of the series: Shark Station! It’s now out in ebook and paperback at Amazon.com and hardcover at Barnes and Noble. I’m excited to announce that my new book is out! It is a prequel to Oceania: The Underwater Series. 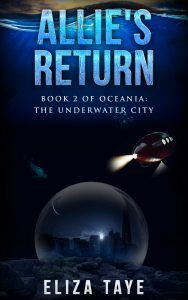 It focuses on how the underwater city came to be and why it was chosen to be a safe haven for humanity. Billions are dead. The world is changed forever. Fear is rampant and for once, humans are the ones on the brink of extinction. But there are survivors and they are determined to never allow anything like The Great Plague of 2083 to ever happen again. The most powerful countries in the world have assembled a group of people to make one decision: how can the human race be safeguarded for future generations? 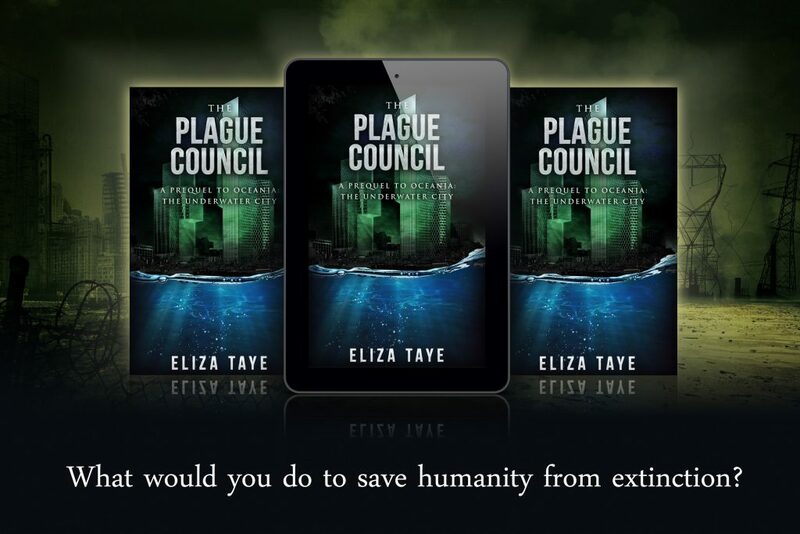 The Plague Council is a short story prequel to Oceania: The Underwater City. Discover how the underwater city came to be. I know it’s been a long time since I’ve written any blog posts here on my website or on my Exclusive Content Blog. However, I’m writing to tell you that my hiatus is over and I am back to writing and blogging. I’m starting work on my next novel, Book 3 of Oceania: The Underwater Series, and I’ll be blogging on my Exclusive Content Blog once a month about Allie’s Return. I hope to have Book 3 of the series out near the end of the year, so stay tuned to hear more about that. 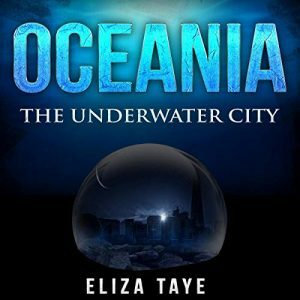 Now Released – The Sequel to Oceania: The Underwater City! Allie’s adventures in Oceania continue in Allie’s Return. Now out in Paperback and ebook! You can get it on Amazon. 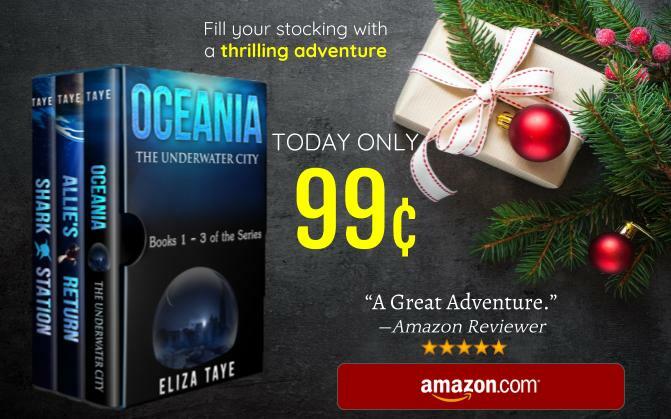 Two summers ago, Allie and Dylan exposed the secret underwater city of Oceania. Now the Above World and Oceania are once again united but that’s all about to change. The Great Plague has resurfaced and spread through the land-dwelling world. To protect Oceania, all outsiders are barred from the city, but not before Dylan sneaks Allie in to protect her. Unable to risk infection by returning home, Allie is forced to find a place in the highly academic society of Oceania. While the Above World scrambles to find a cure to the deadly plague, Allie struggles to find her place in the community that she’s illegally become a part of. Will she be able to find her place amongst the Oceanians or will the perfection-based haven be too much for her to handle? Full of adventures to rival the first book, Allie’s Return continues with riveting undersea action and exploration that will immerse you in the world of Oceania and leave you wanting more. Oceania: The Underwater City is Now in PAPERBACK! I have great news! My book now has a print format in addition to the ebook one! I published the print book through CreateSpace.com and it’s available through the CreateSpace eStore or Amazon.com. 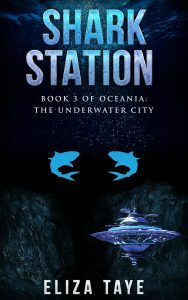 If you don’t have a preference of Amazon over CreateSpace, buying through the CreateSpace eStore will support me more, allowing me to continue writing more Oceania: The Underwater City books. If you prefer a physical copy to an ebook, buy now at one of the above links!